They worked for a little bit, but my sensory bottle at the time was kind of a flop. So a couple of years later, I decided to try it again, but this time, just for fun and as a way to keep my kids busy and entertained for part of the day since we'd be home for President's day. Clear Plastic Bottle (with lid)- Any bottle will probably work, but I prefer the ones with a smooth side. For this project, I used left over bottles from Sparkling Ice. With 21 different flavors, it should be easy to find a favorite. You can either buy them as a pack or as a single in stores. Clear Glue or Clear Liquid Soap (Dish or Hand)- For the project we did today, we used blue dish soap before remembering that we had some clear hand soap, but it still worked out. 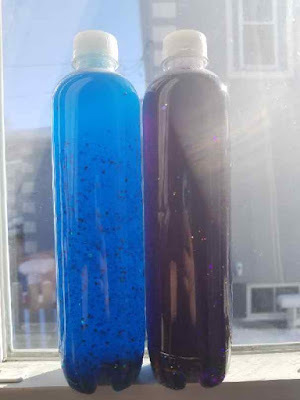 It's ok to use a colored glue or soap, but make sure that you can see through it and also be aware that it could change the color if you add food coloring. 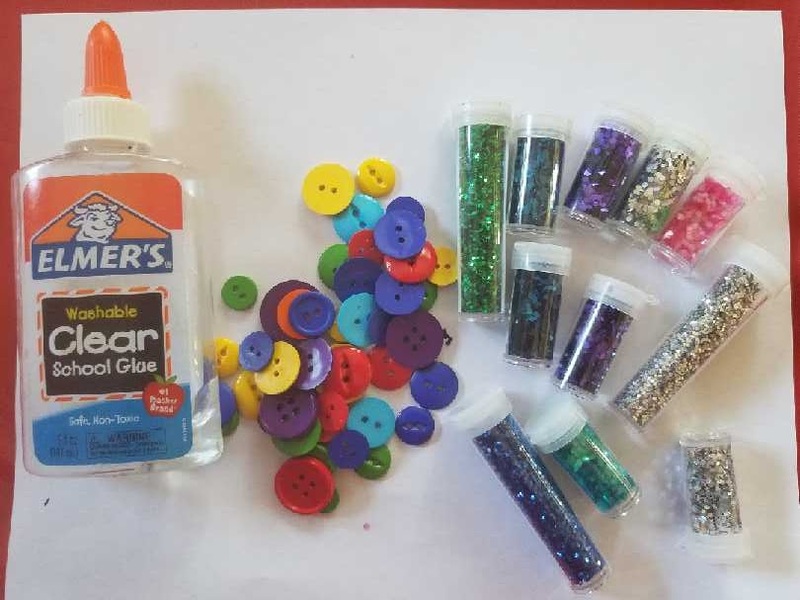 Glitter, Sequins, Beads (water beads), or Buttons- anything that is small enough to fit inside the bottle that you don't mind ever using again because once you use it, it's stuck in there. Step 1: Gather what you need. Step 2: Rinse out Clear Water Bottle so it's clean. Step 3: Add water- the instructions that I got said to fill the bottle halfway with water, but I found that to be too much. Fill bottle 2/5 with water. Step 4: Add food coloring- a little goes a long way. 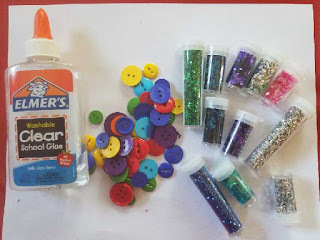 Step 5: Add beads, buttons, glitter, sequins- Choose just one, add a little of all- it's your bottle, add what you'd like. If adding water beads, be aware that they grow, so less is more. Step 6: Add soap or glue the rest of the way. Leave a small space for air. Step 7: Super glue the lid onto the water bottle. Step 8: Shake or flip and watch the magic happen! 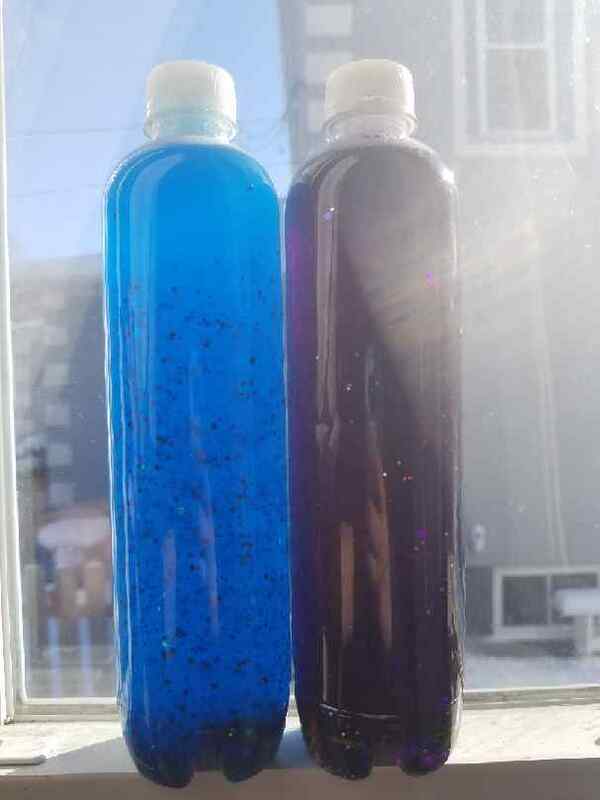 The sensory bottles my son and daughter both made. 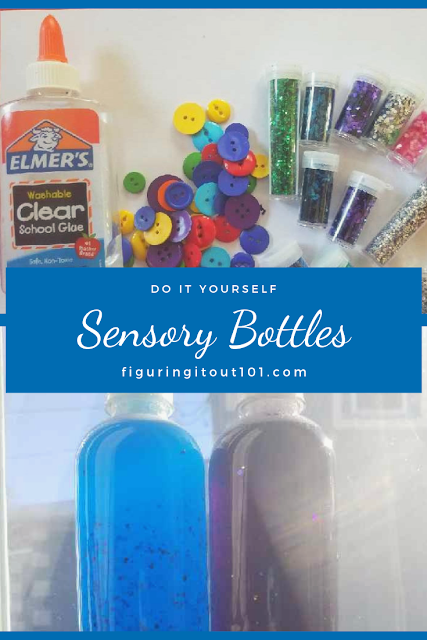 This is the second time that I have done this DIY Sensory Bottle and although it's better than the first time I've made one, there are still things that I would change. This time, I filled the bottle halfway with water and then halfway with dish soap. I would make that 2/5 of the way with water and 3/5 of the way with glue/soap. We used a blue dish soap, so when my daughter added her red coloring, it made a really dark purple. I told her that would happen, and she was ok with that. Clear is better if you want to make a true color. I used a liquid coloring for soap. I didn't have a dropper, so I poured a little bit into each bottle and it made each sensory bottle darker than I would have liked. Start with a drop of dye and add a drop at a time to reach your color. The blue sensory bottle shows the glitter and buttons, but the red/purple was too dark to show them. The silver and gold glitter show up, amazingly, though. Hold your sensory bottles up to a bright window and watch it shine! Enjoy your sensory bottle! It's a pretty quick and fun craft to make. Make sure that the top of the bottle is dry when you glue the lid to it or, there could be disaster, but once it's dry, you should expect a mess free activity that you can use to entertain your child for a while. My kids are a little bit older, so their appeal didn't last as long, but it's something that they can enjoy when they feel the need too... kind of like a lava lamp! This looks like a great craft project for any one! Very cool DIY project! It almost reminds me of a snow globe. Thanks for sharing your learnings too so we don't make the same mistakes. I love snow globes, which is probably why I love these so much. This looks so cool! I'm pretty sure my nieces would love these! Thanks for sharing! Looove craft projects! Thanks for sharing! There are so many things that you can do with it too! This is a great way to keep your young kids busy! My kids loved doing these! Thanks for sharing this great tutorial! These are so easy to make, too. Do you have any great tips? How neat is this. I will have to pick up the stuff to make it tomorrow and do this with my son! You're very creative and artistic! Making this one is such a fun acitivity! What a great idea. I`m not so crafty person but I could try to make these. My kids will love it! These were always my daughter's favorites when they were younger. Definitely fun for a wide range of ages! My best friend always had all sorts of things like this in her house. My favorite was one that explained density and when you shook it, everything would blend, but then slowly separate again. Sensory items are in vogue right now. I know there are some craft and story times at the library where they would be very useful. Looks like a great craft to do. It doesn't surprise me. Stores can make a lot of money by selling fidgets and sensory items, especially since it seems the world doesn't want kids to be active, so they give them something to keep them busy or quiet for long period of times. Their stuff is cooler than my stuff. haha. Sensory toys are really helpful for kids with special needs. 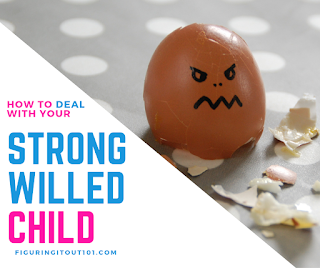 I know my nephew benefited from a few when he was struggling with fidgeting issues. We've asked the school about them for mu son before he was diagnosed with ADHD. 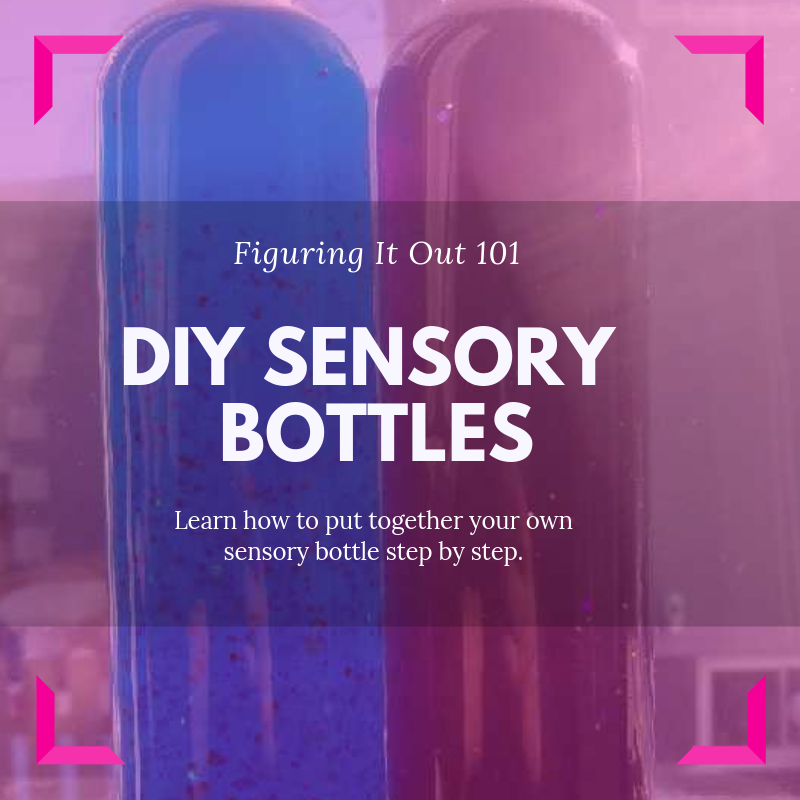 Oooo this looks like a good home project for the family, although mind you I didn't know what a sensory bottle is until this post! Looks easy to do enough! These ended up coming out dark. It's really cool to watch the different things fall at different speeds.